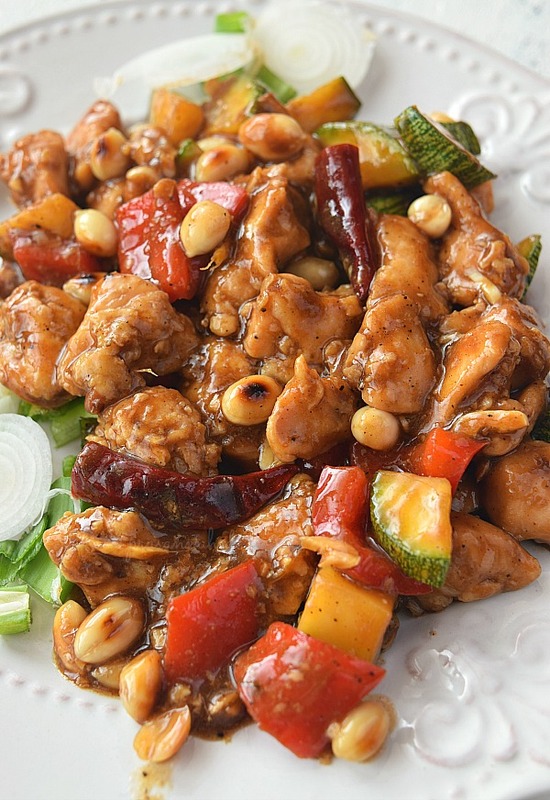 is an amazing combination of soft juicy chicken pieces cooked and tossed in delicious sauces with bell peppers,chili peppers,zucchini and peanuts to make a great dish to put together in no time! If you fancy having Panda Express takeout menu then here is the better than takeout Panda Express Kung Pao Chicken- soft,juicy chicken pieces cooked in amazing sauces along with zucchini,peanuts,bell peppers and chili peppers. This recipe is very easy to put-together and goes so well with some sticky rice or Jasmine rice and also with noodles or chowmein too. 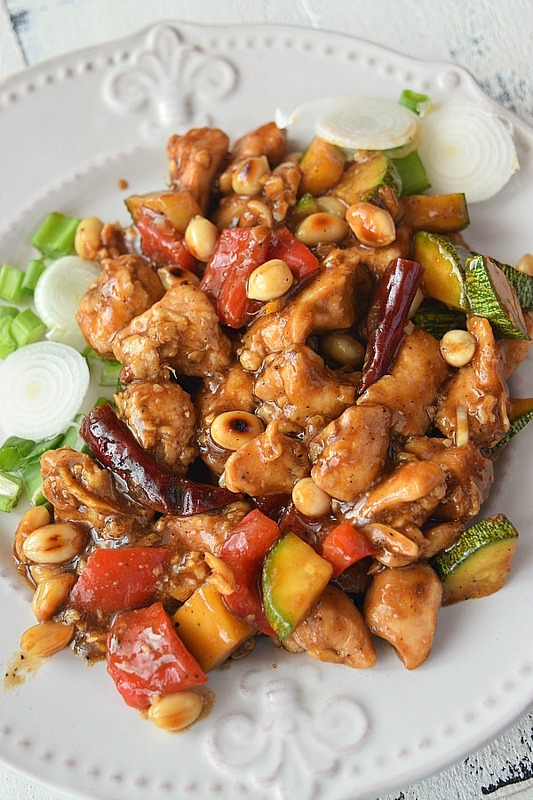 Kung Pao Chicken is not a regular stir-fry dish like regular Chinese food goes- but here the tender,juicy chicken pieces are cooked along with other vegetables in a little sauce. This sauce is very intense in flavors and goes very well with rice and even chowmein or mixed with any other noodles. 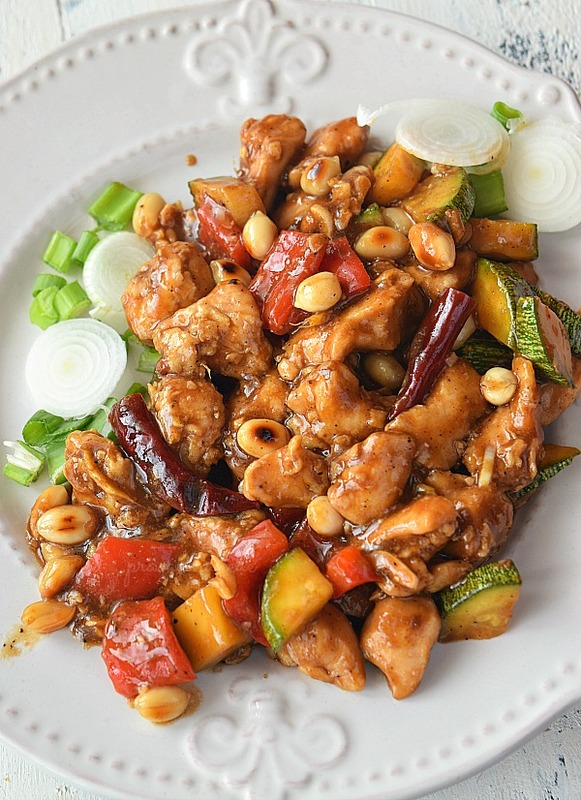 Kung Pao chicken, also transcribed as Gong Bao or Kung Po, is a spicy, stir-fried Chinese dish made with chicken, peanuts, vegetables, and chili peppers. The classic dish in Sichuan cuisine originated in the Sichuan Province of south-western China and includes Sichuan peppercorns. Here is the link to Wikipedia information. 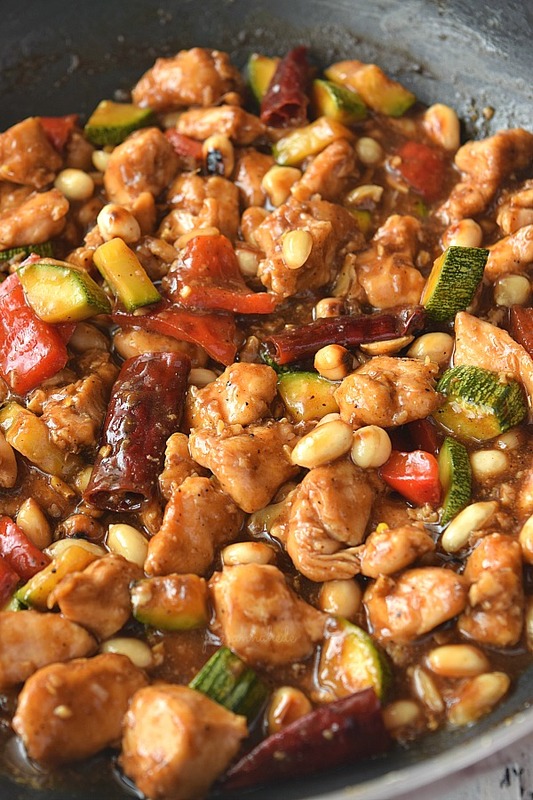 What are the ingredients to make Kung Pao Chicken? 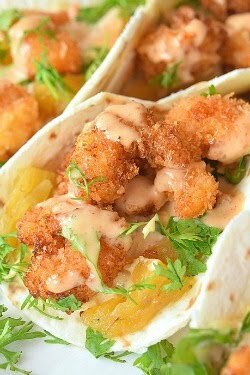 Chicken : Use Chicken thigh meat or breast meat for this recipe. Thigh meat is very juicy so if you want use thigh or use chicken breast meat.I have used breast meat itself. Vegetables of your choice: I have used Zucchini,Red Bell Pepper.But you can add vegetables of your choice. 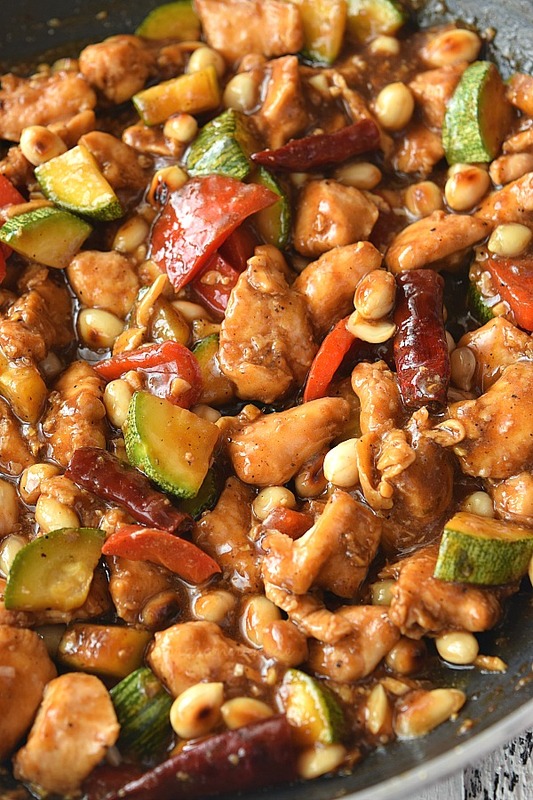 Peanuts: To use peanuts in this recipe or not is personal choice but since kung pao chicken is normally served with peanuts, I have used them. I love the taste of peanuts along with chicken and sauce but you can skip it if you do not like or have allergies. Red Dry Chili: Use the dry red chili available in Asian stores near you. I have used the Chinese chili plus I have seeded them. Use the Chinese red chili as per your spice tolerance or can skip them entirely. Sauce Mix: The most important part of this recipe is the sauce mix which entirely defines the taste of this dish. Here I have used a mix of soy sauce,brown sugar,minced garlic,minced ginger,sriracha,rice wine vinegar. How to Tenderize the Chicken / Velveting the Chicken? To tenderize the chicken or that's called Velveting the Chicken is to marinate it with ingredients to make it very juicy and soft when used in final recipe. In regular Chinese food preparations they use Baking Soda to tenderize the chicken but I have used another way to do this and it makes the chicken delicious too. Here I have used Egg,Cornstarch to make the chicken soft and juicy. Marinating the chicken in little cornstarch and eggs make it very soft when we stir-fry them in recipe. What is Kung Pao Sauce? The sauce used in this recipe is not very watery/liquidy compared to other sauce recipes used in the Chinese cuisine. This sauce is very intense in flavor with very few ingredients and is little thicker than regular sauce,which coats the chicken and vegetables very well and goes so well with rice. The main ingredients used here are: soy sauce,brown sugar,minced garlic,minced ginger,sriracha,rice wine vinegar. 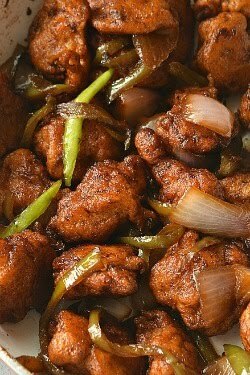 How to make / Steps to make Kung Pao Chicken? First marinate chicken with soy sauce,salt,cornstarch slurry,freshly cracked black pepper and 1/2 of egg and keep aside for few minutes. 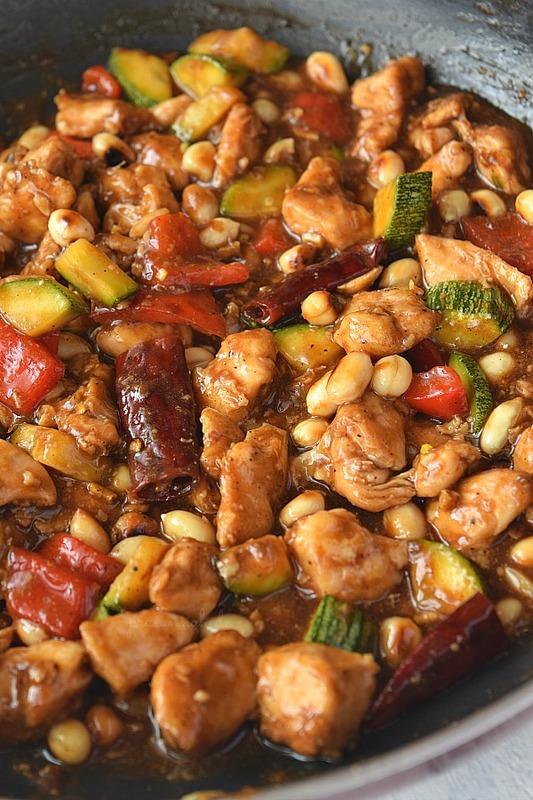 In a pan/wok,add the sesame oil and vegetable oil,when its hot add vegetables ,peanuts and red chili,fry till soft and keep aside. In the same pan add the chicken pieces and stir-fry till chicken is done,then keep aside. Then add the sauce mix and add the cornstarch mixed in water.Stir well and cook for a few seconds. Finally add everything to the sauce mix. 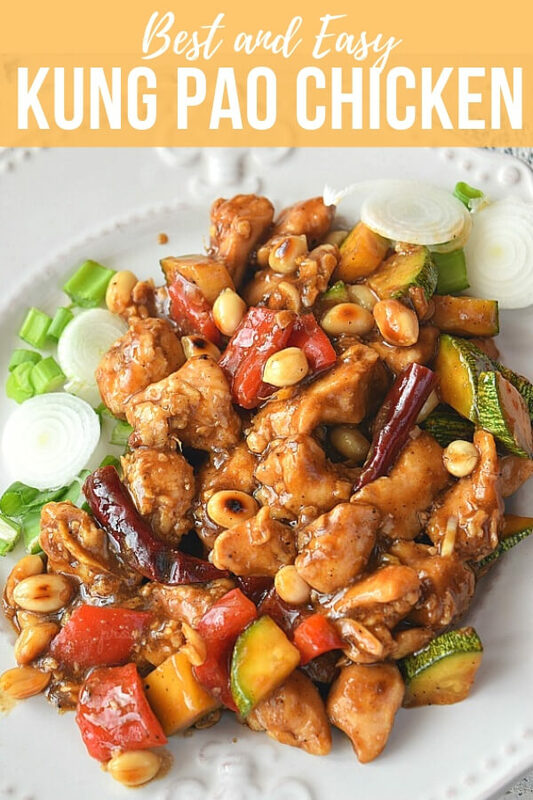 Panda Express Copycat Kung Pao Chicken - so easy and best recipe of chicken tossed with bell peppers,chili peppers ,zucchini and peanuts in sauces to make an extremely flavorful side dish or entree. 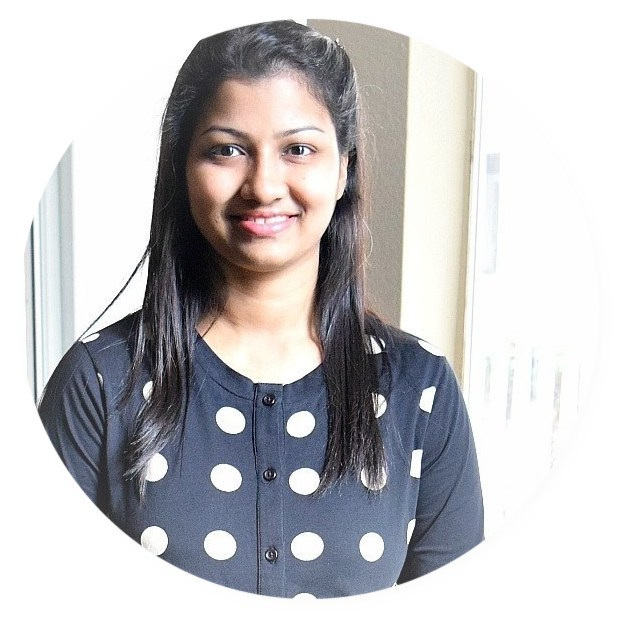 In a mixing bowl,add chicken pieces and add the ingredients mentioned under marination. Mix well and keep aside for a few minutes. Heat a wok/skillet(preferably nonstick) and add the oil and let it get hot. When the oil is hot enough,add the chicken pieces and stir-fry till cooked well. Keep aside. 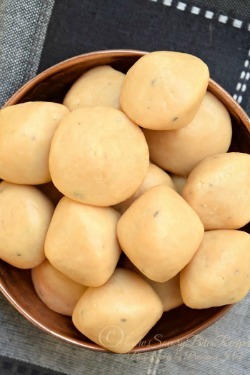 In a mixing bowl add all the ingredients mentioned for sauce mix and mix well. 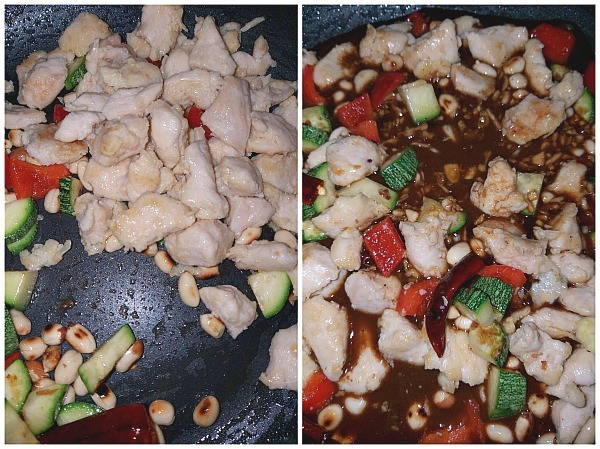 In the same pan,add the chilis,zucchini,peanuts,bell peppers and toss well till they are slightly soft. Add the chicken pieces,toss further,add the sauce,adjust the salt and sugar level and keep aside. 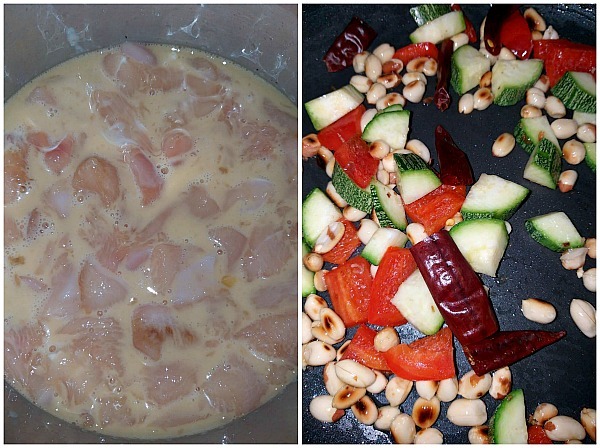 Add the sauce mix and cook for few seconds, then add the veggies,peanuts and chicken. 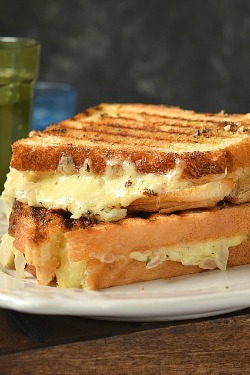 Cook for a few seconds.